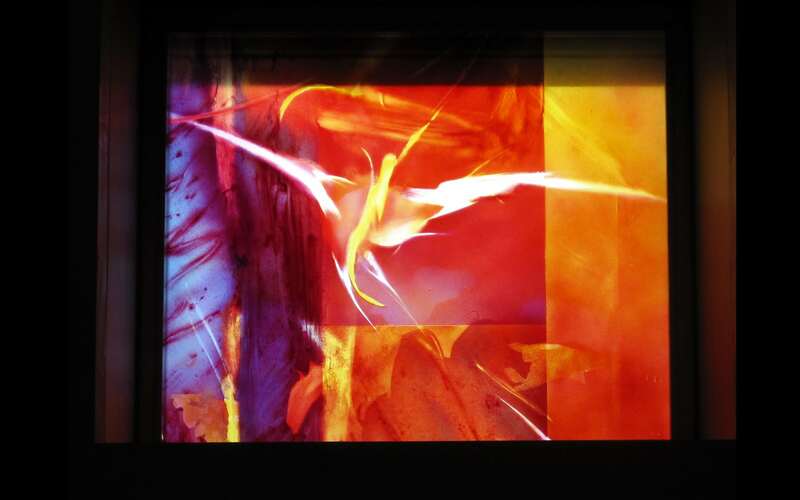 The art glass at Gloria Dei, the Glory to God, is expressed through movement, color and light as in a watercolor painting. 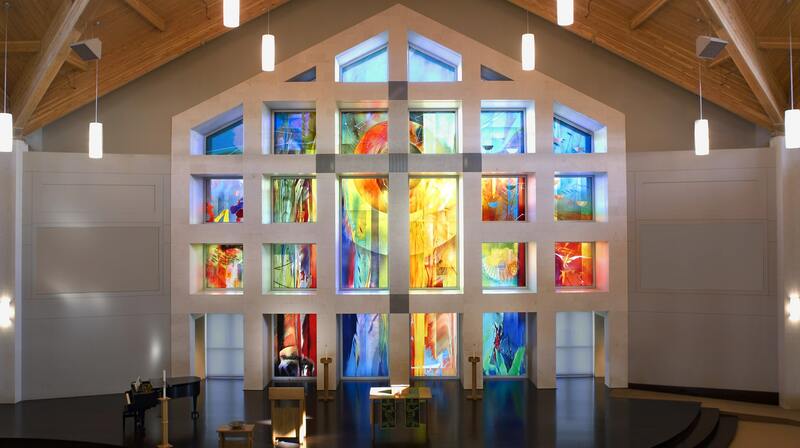 As liturgical art glass, the windows reflect the Trinity and the floor plan of the Church, the 24 panels cycle in thirds through the Creation story beginning with Genesis on the left, the life of Christ in the center, and life of the Church on the right. The generally abstract emphasis evokes the contemporary setting for this new-construction 21st-century worship space. 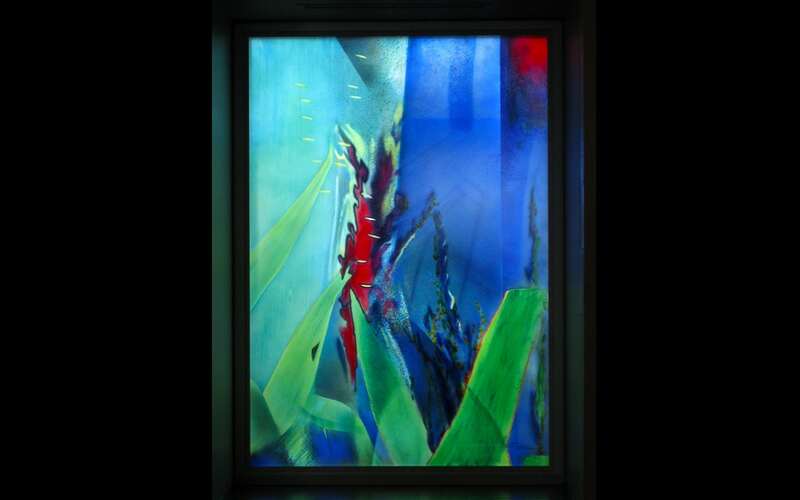 The watercolor art glass progresses with an internal rhythm, panel by panel, repeating motifs and colors to evoke the emotions of joy, appreciation, awe and wonder of God’s work in our lives. Symbolic imagery, specific to the sacraments are represented by egg, water, and shell, and communion with stalks of corn (since this is Midwest corn country). Other panels include stars, seeds, candles and branches which evoke numerous Biblical narratives such as the promise made to Abraham, the psalmist’s exclamation of wonder in gazing at the heavens, the prophecies of Isaiah, and the many parables of vineyards and gardens. 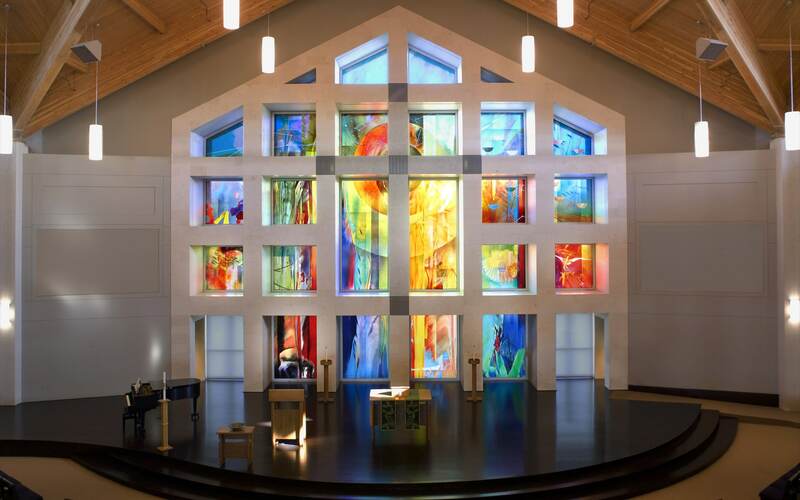 The transcendent qualities of glass, illuminate spiritual themes which allow worshipers to experience the liturgy in distinct ways each time the congregation gathers for worship. For example, a vertical yellow band extends from above in the center and reaches downward to literally touch the earth below. This abstract gesture shows how God can touch us in the midst of our lives. 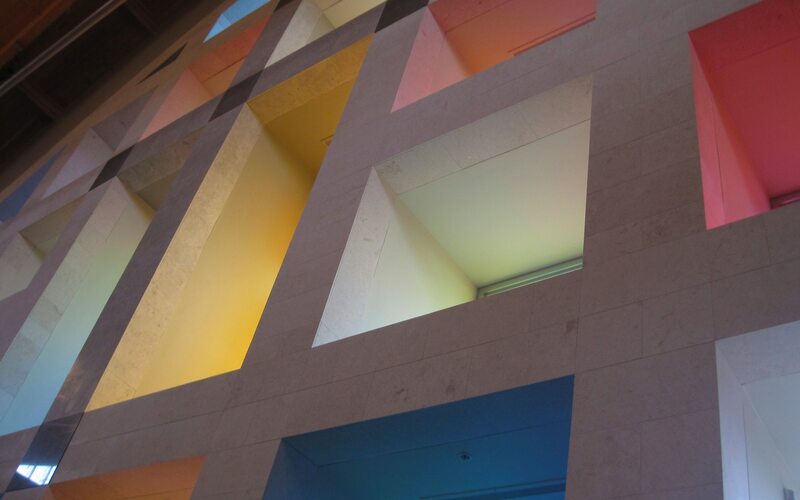 As in a watercolor painting, each row of glass becomes progressively more translucent in elevation, allowing for fleeting changes in the sky and clouds to increasingly register in the shapes and colors seen in the windows. This intentional openness in the design allows for numerous readings and invites each congregant to actively participate in the shaping of his or her own meanings and references from what is observed in the design. It is my hope that this design will resonate with each viewer as a celebratory offering of thanksgiving for all that God has given to us, and to recognize our individual role in the body of Christ to bring peace and healing to the world. 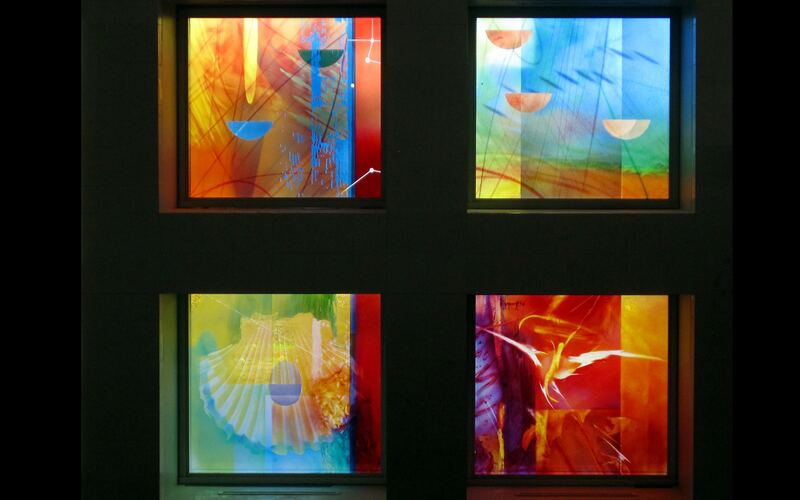 Twenty-four architectural glass panels for the chancel façade: 750 sq. ft. in size and rising over 36 ft. in height. 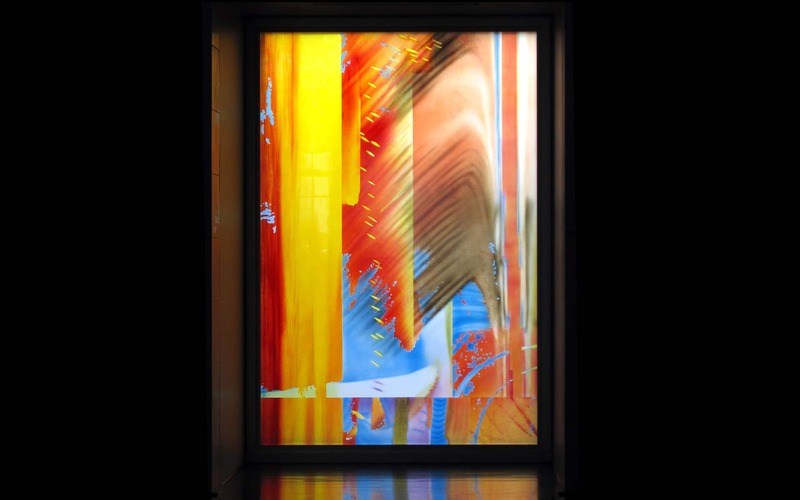 Each panel was created using a number of traditional and contemporary glass treatments, including silver stain, acid-etching, sandblasting, and enameling.